Do quick tips really work in dog aggression training? I mean, dogs are living creatures, right? There’s no shortcut to good dog training with Dog training services in Salem County, Camden County. Here. I’ll give you 5 powerful tips to start with your dog today. These tips will give you some immediate results. Results that should encourage you to fully train your dog, that is! Control everything of value to the dog. Don’t be a control freak but have first rights to everything as if you are respectfully eliminating conflict. It’s when you lose control of resources that the dog begins to compete. A couple of popular examples are to make the dog wait for food and to go out the door, but also use the grass as a reward. stop, get his attention, then release your dog to the grass. With affection, don’t give it to your dog right away. Wait for him to At least want it. Let’s not forget about other people as a reward. Yes, control your dogs access to other humans also. Sound to domineering? Well, Consider your kids, for example. You control their curfew for their own good, yes? So, if we use control on a human, we should also do the same with a dog. The big payoff? When combined with these other dog aggression training tips, your dog will stop being demanding, barking, jumping. You may even find your dog coming on his own and not pulling as much. Taking control of your dog inside the home is one thing but Outside is another story. Walk back and forth with your dog Outdoors. Do 10 to 15 Steps, switch directions and continue. 180’s are actually a popular dog training exercise, and I’d suggest they’re more powerful than one might think. 180s are used for leash pulling and does help somewhat but the greatest feature of 180s is leadership. It shows the dog repeatedly where to go, and where not. The dog Learns that you want to control group movements. Its like you’re grabbing him by the lapels and whispering “I exist”. Every turn causes your dog to see you again, and gives him stimulation from refocusing. How do you know you’re making progress? It’s when you turn and don’t need as much leash pressure. Let him volunteer to make the turn as much as possible. Do this once a day, 10-20 minutes, for 1 to 2 weeks. He may be a rascal when the exercise is over but do it every day, combined with these other dog aggression training tips, and your dog will change. There are various other factors that an effective provider of dog training services in Salem County, Camden County follows. Dogs have 1.6 seconds to connect a stimulus to a behavior. After that they don’t learn as fast. When training your dog using positive reinforcement, are you using a treat pouch to reward on time or digging in your pocket for 10 seconds? During the accountability stage of your dogs training plan, are you watching His “heel”, or does he pass you, and doesn’t learn from a late correction? This tip is pretty cut and dry. More examples? When you teach Fido fetch with two balls and he drops one, immediately throw the other (like lightning) as a reward. Working on puppy training? Set it up to reward your pup just as he finishes urinating or defecating. Outdoor, that is! Well, there you have it. Go and use good timing with your animal friend! A dog should be trained and provided for. However, if you’re serious about your dog’s management plan and at least have leadership, a quick separation from your dog can prevent some unwanted Behaviors. Duration: 30 seconds at a time. Remember, dogs are instinctual. This is more repetition than prolonged. Visual: dogs are very visual and masters of body language. Unless the timeout is around the corner or in the bathroom, put a blanket over the crate so the dog can’t see you. Why are timeouts so effective? It’s pack separation but more specifically because distance between a dog and his human is very unpleasant. I know, I know, ignoring your dog may not sound like much fun but let’s be honest. It’s not only about dogs making us happy. If your dog is allowed within 3 feet of you, too often, it can be like a drug addiction for the dog. Dopamine is a neurotransmitter that controls the pleasure area in the brain. Too much of this is unhealthy. Also from a leadership standpoint, having your dog next to you in high frequency is a bad idea. What do you do? When he approaches you, do not acknowledge Him. Let your dog calm down, then say his name. by doing this you’re accomplishing a lot. You’re initiating interaction with your dog. You’re allowing oxytocin (the love hormone) to be released, minus the dogs arousal. You’re reinforcing the dog’s name. I’d even say you’d be strengthening your dogs recall command with This tip. Think about it. Why would a dog not come? It’s because he’s already had his fill. All of these tips are Interwoven. Practice this and your relationship will improve. Hopefully it’s obvious I didn’t hold back with my 5 dog training tips that you will get with Dog training services in Salem County, Camden County. If you’ve heard of some of them before, then maybe now you have a different Perspective. 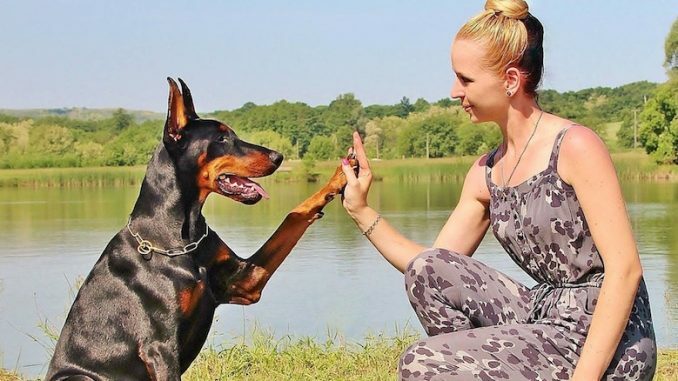 Don’t get the wrong idea about these dog aggression training tips vs. a customized management plan, but of you practice all these principles you’ll be taking a huge step in the right direction. Until next time!